POURING rain did not deter more than 2500 Christians who marched through the streets of Brisbane on Ash Wednesday night in a display of ecumenical solidarity to celebrate the Year of Christ’s Jubilee. 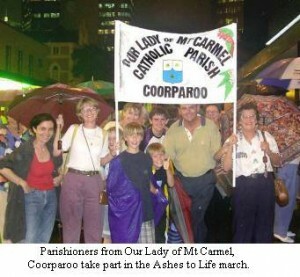 The Ashes to Life celebration began with marchers gathering at their respective centres of worship before joining the procession which ended at the River Stage in the City Botanic Gardens. St Stephen’s Cathedral was crowded with people who had come individually and in parish groups from as far as Cabooolture and Beaudesert. After a liturgy led by Archbishop John Bathersby, they stepped out into the wet city streets to join other Christians from the Anglican, Uniting, Church of Christ, Lutheran and Baptist Churches and the Salvation Army. Many carried banners and messages, breaking into spontaneous song along the way. At the River Stage there was an ecumenical service of repentance in an Ashes to Life liturgy with the theme ” “Broken by sin, seeking forgiveness in Christ”.